This post guest-written by Steve Poland, who writes making money online ideas at his own blog. Shoemoney’s post on ‘Spamming Through Google‘ a few months ago got me thinking about how this flaw function of Google could be exploited to game Google AdWords. This flaw function of Google is that you can use a ‘google.com’ URL for basically any domain/webpage and it’ll act as a redirect to that domain/webpage of yours (requirement: the domain/webpage must be listed in Google’s index). 2.) You can reduce the initial bid price required by Google AdWords on various keywords, because ‘google.com’ has a high quality score within Google AdWords. I did a test on this, by creating brand new AdGroups with new ad copy — “A”) ‘Google.com’ was the display and destination URLs; “B”) ‘Cleverclasp.tv’ was the display and destination URLs; “C”) ‘Cleverclasp.tv’ was the display URL and ‘Google.com’ was the destination URL. The results were astonishing. “B” and “C” had the same pricing. For the same set of keywords and same ad copy, some keywords for “B/C” were a minimum of $10, whereas for “A” the minimum was $0.50. You can see in the chart below the cost differences. After creating the AdGroup for “A” (‘google.com’ as dest/disp URLs), I then changed the destination/display URLs to ‘cleverclasp.tv’ — and the minimums were still $0.50. So this is a maneuver to (potentially) reduce your initial bid prices on AdGroups. So what is the redirect URL for Live, Yahoo, and Ask? There are none — from what I can tell. They don’t appear to offer anything similar to Google’s “I’m Feeling Lucky” button. But if you can find other domains with redirect functionality and high quality scores, then you’ve found other ways to lower minimums for initial campaigns. Very interesting. I would assume as this gets “out” it’ll be a short time before you can do this. I’m not sure i caught it, i must read it again.. the destination url is where u used the redirect or the keyword url? This is a pretty neat hack. I expect a google smackdown pretty soon on it though. Surely if it is a redirect, then the site that you are directed to is not google, and thus that is not allowed as the display url? As far as I have been told, If I put google.com and then redirect it to my site that is not allowed because the display url is not even related to the site you actually land on. Great idea. Although google will surely fix it, finding other redirects that are similar (with high quality score domains) could prove profitable. Even if google does fix it, you can get in now, and get your bids low. By the time they fix it, you’ll already have passed the good quality of the google domain to your lower quality domain, essentially making it equal to google as far as the Adwords QS is concerned. I wouldn’t try this on your main account if you already have profitable campaigns running. Can you really do this??? If so, i think they will fix it soon just like they did with special caracters like >> or <<. Very interresting. I read the original post from Shoe again, and basically I think the same methoed can be used to game up the relevance on a website/page refeering to one of your affiliate sites. Seems theres no use for paid links now with this possibility as Google look at the link and sees google.com and then rank it higher then most other links, at least thats what I believe, maybe Shoe can give a point of view here??? Exactly, it’s simply matter of using something to your advantage while you can, definitely not what one would call dishonest. Nice method!! Also everyone you should try another method as well w/ this one! Here is a tip for everyone, this has save my company over 20,000 in the past 3 months in adwords costs. Create a ad (DUH!) the let it run for about 10 min, then create another ad version, BUT create one for mobile ads. It does not matter if your site is not mobile ready. muh spellingz are the lose today, sorry! Damn!!! Some fine tricks i learned today. Nice. So if I understand good: if you display url of google, but your redirect the url to your homepage you don’t have to pay much money? This is soooo cool …. I’m sure by now they read this. Enjoy and make the money while you can! great post. This would work for about 2 days until you get a manual review or your competitor reports you – whatever happens first. Short-lived strategy that’s not worth the trouble. Plus after getting some press via this site it’s sure to be even more short-lived. Dishonest or not, I’m sure its against Google’s rules, and will fix the “flaw” very soon. Why anyone would risk being banned permanently from AdWords beats me. There’s a lot more to lose than to gain. Very impressive hack, too bad Google will be all over it soon enough since its now been leaked. But I can honestly see a whole slew of new hacks coming up in the near future which increases Quality Score and reduces CPC. Thanks for giving me something to think about! Not sure if “dishonest” is the right word for this. Gaming sounds more grayhattish to me, not necessarily black. Pretty cool evil technique. I’m going to have to try it out. If you are going to try it, do it today…expect a crushing blow via G on this one soon! So what have we learned? You can use different destination and display urls. Shocker. Not like this wasn’t known before. Posting things like this angers the gods. It will be interesting to see if Google traces a sudden jump in gaming tactics back to here and then rips shoes arm off to smack him with the soggy end. Wow! This is my read of the day 🙂 Keep up the good work! I think they’ll just take away the credibility score of the redirecting url. This would be the most logical move, since the site you’re redirected to is more important anyway, especially because some people use the redirecting URL for tracking purposes. There is a manual review and you would get kicked. Trying to ride on the credibility coattail. Have Google Host your Landing Page for you instead. If they weren’t already on the look out for this they sure as hell would be now. I wouldn’t touch it with a ten foot pole. Nice iea, anyone else had good results before I try this? I find it interesting that for every zig there’s a zag, and the game goes on and on and on and on……….. I see all the people complaining about Google will catch this, if they haven’t already… Oh, the redirect is against policy, etc. You are missing the point. The point is that the advertising rates are a black box. The quality score is a black box. Look at this another way… lets imagine the super bowl. Lets say for prime ad spots during half time that there are four ads times that are sold. Spot 1 goes for 1.5 million dollars, spot 2 goes for $1.2 million, spot 3 goes for $5,000, and spot 4 goes for 1.1 million. If the other advertisers got wind of this, they’d probably be pissed. What if they found out that advert 3 was a subsidiary of the company that runs the super bowl and thus paid only a token amount. Then, as an advertiser you find out that they’ve been paying only a token amount on all their adverts across the network. The network just kept telling you that you had to pay the going rate but with the advice that if your advertisements or company was of “more quality ” you might pay slightly less. In the end, it wasn’t really about quality. 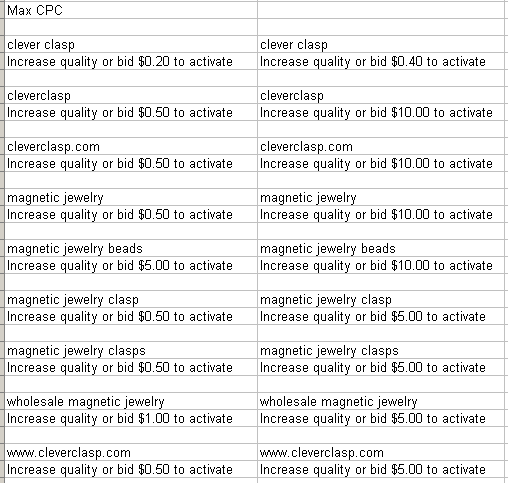 There is no way that Google is a better site for cleverclasp.com than the actual web site. While it doesn’t affect every one, if Google is playing in your same ad space – why? They often have little content or text that describes the products that they are promoting. They are automatically assuming that they, themselves, are a quality site. It is not like they have to be “quality” and have scores that reflect well and thus outbid you for advertising. If some of your competitors use Google owned advertiser services (double click), since it is a black box anyway, who is to tell if there aren’t some sweet heart deals between Google and Doubleclick? If you are an SEO do you think you are really going to be able to compete with Performix in the SEO space? Hrm, let me check to see why Google isn’t ranking you as high as it should… vs. let me Q/A your site, run some A/B tests, and see if we can hit or miss, gain you a top 10 ranking…. I don’t accept this particular post. Even so, I had researched in Yahoo and I’ve found out that you are right and I seemed to be thinking in the incorrect way. Keep on publishing quality articles like this.